Race Description: The Lowell 50 is a classic old world style gravel road race. You’ll race along the banks of the Flat River and through rural Ionia County on approximately 90% unpaved roads. You may choose from either our 110, 34 or 15 (110 mile & 15 mile are both new for our spring race only) all routes are single loops. The courses are challenging, scenic, and fun. Including one historic wooden covered bridge dating back to the mid-1800s’. Where: The race will start and finish at Fallasburg County Park. This park was first opened in 1929 on 56 acres of land. It now encompasses over 180 acres including two spring fed streams, an island on the Flat River, and a portion of the 4000 mile North Country Trail passing through its boundaries. The park also boasts paved and unpaved walking paths, several play grounds, ball fields, and a disc golf course. 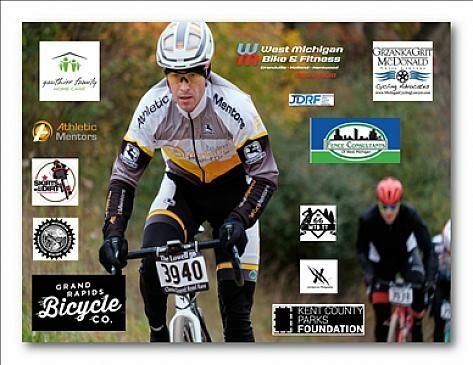 Bring the whole family; Fallasburg Park is a real gem and a great venue for this bike race. Who: This race is for anyone who wants a challenge. From the elite road, cyclocross, mountain bike racer, to those of you just looking for a great ride. What Bike: Road, cross, mountain, fat, or tandem, your choice. Any bike will work, bring your favorite. Timing: RFID chip timing with (Times -7) Slimline linear timing mats and high speed video. Parking: Convenient parking directly across from the lodge (600 - 700 vehicles). Race Packets: You may pickup your bib number with timing chips Saturday morning between 7:30 and 9:30 am at the Fallasburg Park lodge. Awards: Medals/Cash to the top three overall finishers, both races.